CWC Auto Services was established by Nat McGahey in 1980. The workshop has provided quality services, repairs and advice for many valued customers and now their children and even grandchildren. We are here for the long haul. Nat is one of a very small group of the most senior and long serving automotive technicians in the ACT. He has employed and seen twenty five technicians through to completion of their trade qualifications, including three very successful women. The CWC business model keeps customer service and satisfaction our top priority, made possible by the use of advanced software enabling us to track every customer and every one of their cars. We can tell you when your last battery was fitted, how much it cost and the kilometres you’ve travelled since then. We’re all about responsible accountability, which we maintain with immaculate records of everything about every vehicle and customer we meet. 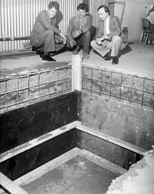 Pictured Left – Nat McGahey and Legislative Assembly members Peter Vallee and Greg Cornwall beside the vehicle inspection pit as it was installed in 1980. Picture courtesy of the ACT Heritage Library.